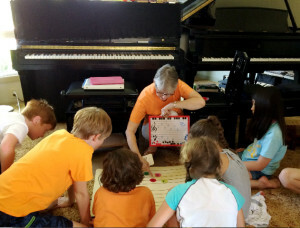 We had a fabulous 2014 Suzuki Mini Camp learning how to improvise. Starting with changing up our familiar Suzuki pieces as creative solos, students went on to break new ground. We began with “World Piece” from Pattern Play written by Forrest Kinney. BTW, I was privileged to meet and work with Mr. Kinney at the NMTA Conference this year in Chicago. Through collaboration with partners and each duet team created their own original improvisation. The pieces were titled and premiered for our Class Lesson Pool Party! Everyone agreed that our exciting improvisation camp was just the beginning of something they want to continue exploring!